Distinct Moroccan style patterns and thoughtful seat design distinguish the Cosmopolitan Collection. 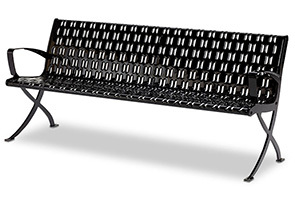 Exceptionally versatile, the benches are available in a variety of configurations perfect for both interior and exteriors commercial spaces. Ready for high volume use the all-steel construction is supports 200 lbs per linier foot. 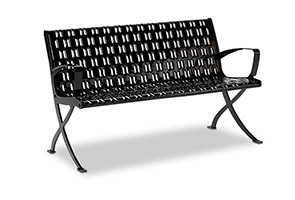 The seat assembly is protected by .125" thick plastisol coating while the frame is powder-coated finish for lasting rust, mold and mildew proof performance. Comes standard with pre-drilled holes for easy surface mounting and stainless steel hardware.